Google has an interesting date bug issue right now in the search results – when there is an embedded YouTube video, Google will show the date from the YouTube video, rather than the date the article was actually published. Here is an example from this site. 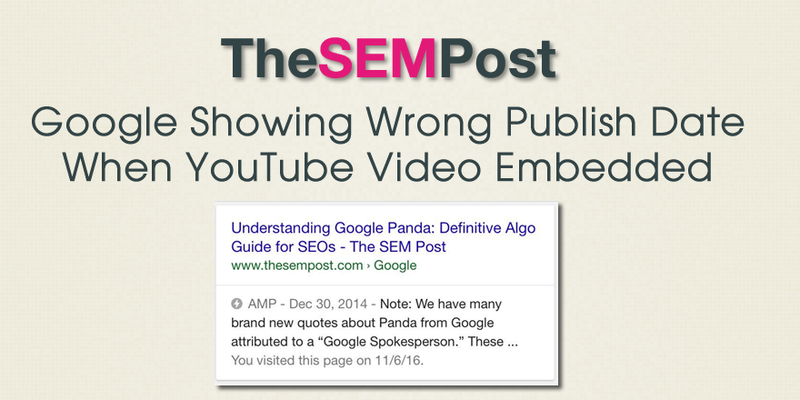 The Google Panda guide was published in 2016, but since there are many YouTube videos embedded within the guide, Google began pulling a date from one of the videos as the publish date. This seems to be a bug, and will likely be corrected. There is a possibility the change was deliberate, perhaps to show a more accurate date since some sites try to fake the freshness of an article by changing the publish date. But this obviously won’t work in all cases since there are many opportunities to embed older videos, even if the content is current. For my Panda guide for example, since Panda has changed significantly since 2014, it would give the searcher the impression that the information is old and outdated. This only began happening within the last week or so, and shows on both the mobile and desktop results. Previously, Google was showing the date accurately.